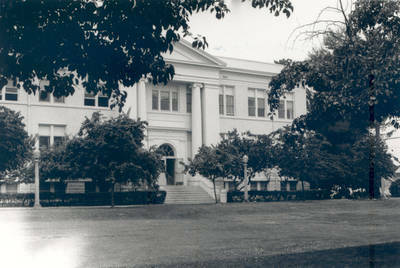 "Reeves Hall, Chapman College, Orange, California,1979"
Reeves Hall, Chapman College, Orange, California, June, 1979. This historical building (2 floors, 17,862 sq.ft. ), completed in 1913 is named in honor of George N. Reeves, president of the university from 1942 to 1956. It is listed in the National Registry for Historical Buildings and houses the Kathleen Muth Reading Center, College of Lifelong Learning, and the School of Education. Originally constructed to serve Orange Union High School, it was designed along with its twin building by Santa Ana architect Frank Eley. Acquired by Chapman College in 1954. BW photograph; 3.125" x 4.625"